The true sun observance of the vernal equinox, in Jerusalem (as will be observed on a horizontal on the sun dial) will take place on March 20, 2017 (Jerusalem date and time). Please note that the equinox date and time seen on typical calendar is the mean sun calculation of the equinox and not a true observed sun dial event. This year the mean sun calculation is estimated to be occurring during the day time hours – form our observation research , we have noted that when this is estimated as occurring during the day time, we can be confident that that that day will also mark the sun dial observation event. However if the mean sun calculation is estimated as occurring during the night hours, then we can be confident that the true sun observation of the equinox event would be occurring the next day. Also note that our calculation of the timing of the equinox is as it would be observed on a horizontal sundial in Jerusalem as the biblical meridian of Divine time, and not the geographical co-ordinates where any person lives on the earth.. This means that March 20, 2017 is Day 1 of the new biblical calendar year, with the first weekly sabbath falling out on Thursday 23rd March 2017. On the continuing arguments of the Biblical Calendar…. Some would argue that because in the time of Enoch there was a 364 day solar year, so then a theological 364 day solar year similarly must be theologically constructed today (but today actually has a 365.25 day solar year, because the earths orbit is no longer in a 364 day year as it was in the pre-Noahic antediluvian times) but in an attempt to impose a 364 day calendar on a 365.25 solar year they interpret Enoch’s terminology of “the gate” (as Enoch describes the day of the equinox as the day the sun entering through “the gate“) to mean a day that is not to be considered as a part of the biblical calendar year – effectively a non-day. Thus they claim this as theological proof that the day of the equinox is but a “gate”and not a day and so cannot be counted as day one. Rather they say as it is to be regarded as a non-day for the calculation of the calendar, the following day of the incidence of the equinox is to be counted as day one of the new year. The question theological construction faces is this – if this expression of Enoch (“the gate”) is to be interpreted effectively as meaning “not a day” then when Enoch also describes the day of the second equinox of the year, as a day when the sun again enters through “the gate” (precisely pinpointing the middle of the solar year) why do these same theologians conveniently not count the second equinox of the solar year also as a non-day? If they apply their theological interpretation faithfully to Enoch – then should the second equinox day in the year also not be a non-calendar day that cannot be included in their calendars. Clearly it is not being included because they would then have a 363 day religious calendar. Clearly there is something amiss of their preferred interpretation of Enoch’s term of “the gate” and they need to justify themselves by making another theological rule – the day of the second equinox of the year is to be glossed over. However contrary to such theological consultations, there was indeed a time pre-Noah when the earth’s orbit was p had a 364 day orbit around the sun – perfectly divisible by 7 day weeks and the fist equinox marked the beginning of the new year and the second equinox marked the beginning of the second half of the year. 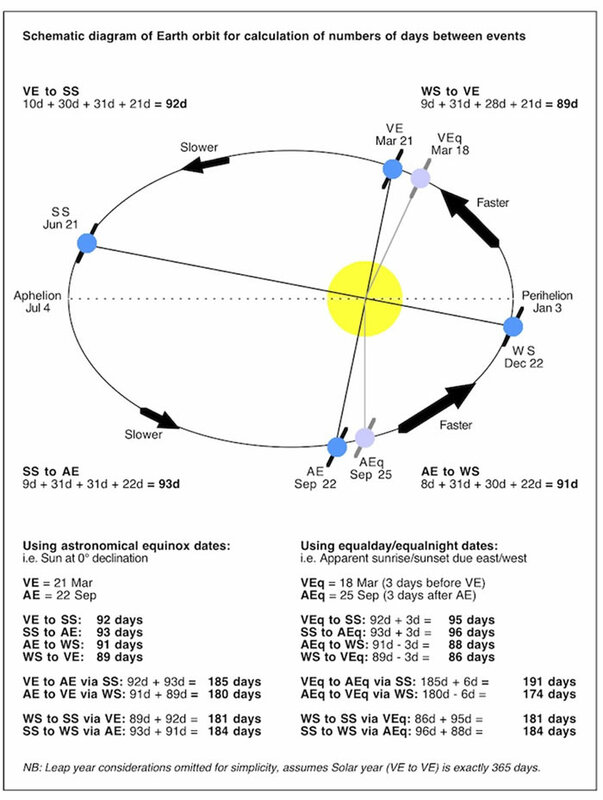 Today however the earths orbit is more elliptical ‘than the pre-flood time and there are more days existing between the first (vernal) and second (autumnal) equinoxes of the year (185 days) than the second equinox (autumnal) and the new (vernal) equinox of the next year (180 days). This is because in the earth travels at different speeds around the sun as it goes along its orbit, as demonstrated in the diagram below. This great change in that occurred the number of solar days in the year from pre-noahic days to the current solar year is historical physical proof of the occurrence of the great judgement of the great cataclysmic Noahic flood, where the ancient documents record the planet Venus entered our solar system and severely impacted the changes on the earth. Today there are endless arguments about the biblical calendar, and the more religious the spirit the more dogmatic the argument. Whatsoever, scripture singularly instructs that the signs of creation are to be used for the identification of days and time, as opposed theological arguments and constructed religious law (Gen 1:14). Furthermore, prophetic scripture informs us that there is no biblical authority existing on earth today that is singularly ordained with the task of declaring such a calendar. Scripture tells us (Ezekiel 44:24) that it is only after YHWH restores the Zadok priesthood to His millennial Temple that only then will the worship calendar be authoritatively declared and observed. However, if we have a yearning heart for YHWH’s sabbath and memorial festivals, the authority today is the signs in creation (see: Gen 1:14) and when we look to creation today what testimony do we find? We find a 365.25 day solar year and not a 364 day solar year! Furthermore in creation there is no day that can ever be called “not a day” – every day the sun shines, and the earth moves around in its orbit . Consider all forms of life that exists around one – does it suddenly not have a day of life on the day of the equinox for the sake of religion? Does it stop aging for that day, stop feeding or roaming for food? In creation, there is actually no zero day – there is never a non-day – every day the sun shines. When it does not shine it is either night on the earth, or the sun or the earth’s current existence has been interrupted in some way – and if that interruption is permanent then according to YHWH’s Word , His promised covenant of the millennial reign of Yahushua, of the line of David, would be no longer be applicable. Indeed it is possible for YHWH to cause the sun not to shine on a day or go down earlier at noon (see Amos 8:9) or even go backwards in earth time 12 hours etc, as a demonstration of His power over creation, but we understand that would be a temporary effect due to the earth being caused to wobble on its axis for an instant of judgement by a great passing upset in the solar system, until a new balance is restored when the earth then continues to rotate due to electro-magnetic forces interacting with the sun. We know this because YHWH tells us to consider the sun and as long as the sun shines He will remember His covenant with Abraham, Isaac and Jacob – and that means the sun keeps shining through the millennial reign. In creation, the day of the true sun incidence of the equinox is day 1 is the sign of the beginning of the the new agricultural season and the new agricultural season and the beginning of the new year – the day previous to it was the last day of the previous agricultural season and the past year . Below is an image of the expected incidence of the occurrence of a sundial observance of the day of the vernal equinox in 2017 as will be able to be observed in Jerusalem which is the prime meridian for biblical time).